It’s that time of year again to get our hands dirty for the Greater Englewood Unity Day in connection with Chicago’s Citywide Clean and Green Volunteer Clean Up on Saturday, April 27, 2019. 10:00am – 1:00pm: Clean up @ Various locations – RAGE will be cleaning at the RAGE Campus on 66th & Union – See flyer below and call RAGE at 866-845-1032 if you want help us out! Breakfast and the Unity Celebration will take place in the Jean Carter-Hill Community Garden located in front of Nicholson STEM Academy – 6006 S. Peoria Street. Please register for Greater Englewood Unity Day using the appropriate registration link below. After you complete the Google form, please call 3-1-1 to place an order for clean up tools (rakes, shovels, brooms, bags) for your site/block ASAP. For more info to get involved contact Imagine Englewood If at 773-488-6704 or info@imagineenglewoodif.org. 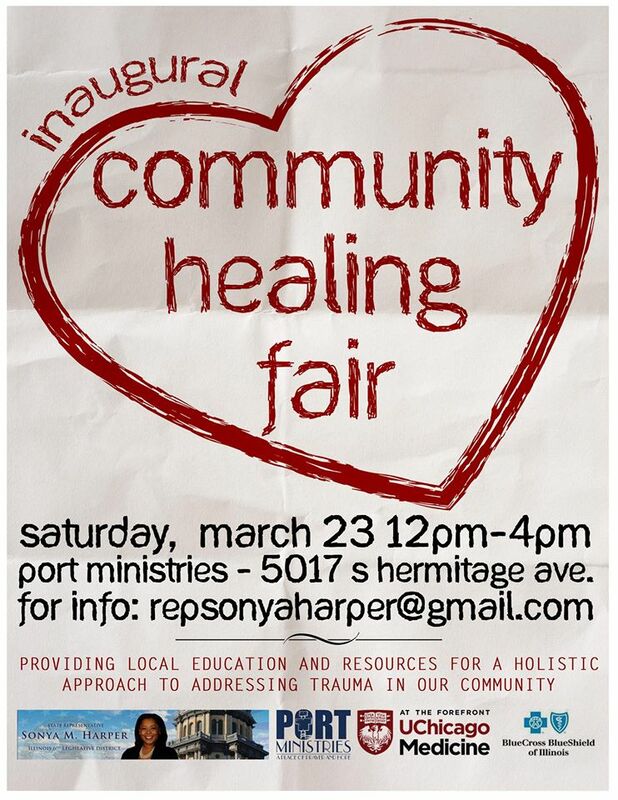 The inaugural Community Healing Fair is the beginning of a community-driven initiative intended to bring together numerous institutions who provide local education and resources for a holistic approach to address trauma in our community. This is a FREE event being held on March 23 at the Port Ministries located on 5017 S. Hermitage. Food: Food and drinks provided throughout event. Vegan and Gluten Free Options Available. For more info contact State Rep Sonya Harper’s office at (773) 925-6580. There will also be wellness workshops, health resources, FREE food, and a special new school vs. old school basketball game! All classes are FREE but space is limited so arrive at least 30 mins. before your class/workshop to sign up! Bring the whole family out for this fun fitness experience! For more info contact us at 866-845-1032 or email us at joinrage@gmail.com. 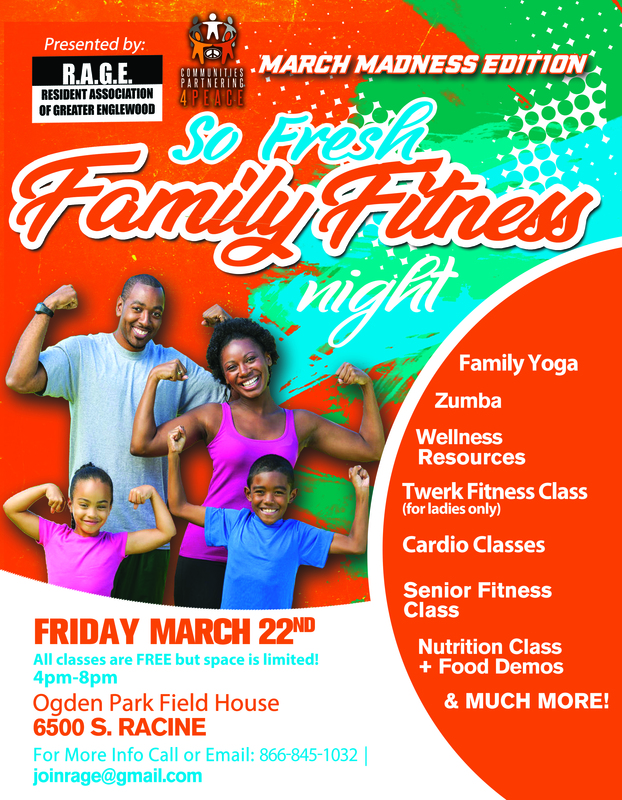 It’s March Madness Englewood, let’s get fit & fresh together! If you answered yes to any of these questions, this open house is for you! 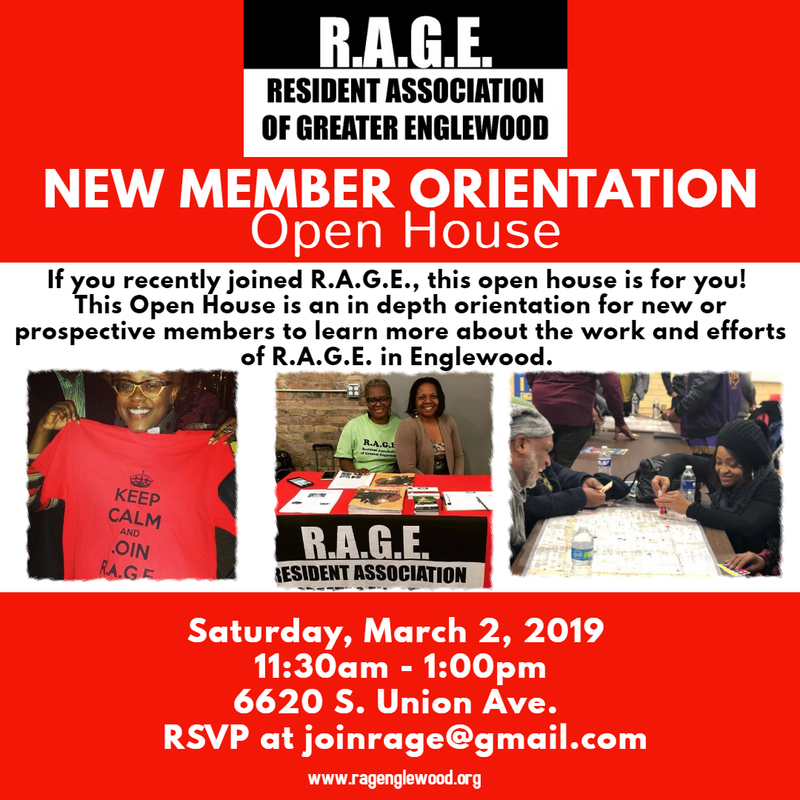 Join us Saturday, March 2nd from 11:30am-1pm at the RAGE Headquarters located at 6620 South Union Ave.
At this Open House, we will provide lunch and have an in depth orientation for new and/or prospective members to learn about the work and mission of R.A.G.E. in Englewood. We will answer all of your questions about membership as well as update you on our current and future initiatives. So bring your neighbor and join this resident-driven association. All will receive a complimentary dinner, hear R.A.G.E. updates, learn about the Vote Equity Project, and listen to more updates about Englewood’s three year Public Safety Initiative (THIS IS MY ENGLEWOOD) T.I.M.E. 21:36! So please join us as we gather to “connect, build and take action to force a change in the community.” For more information, contact R.A.G.E. at 866-845-1032 or email joinrage@gmail.com.